Western historian Denton (Faith and Betrayal, 2005, etc.) offers a revisionist treatment of the fearless Pathfinder and his talented, ambitious wife. History has unfairly maligned John and Jessie Frémont, the author argues. Both were attractive, charismatic figures: bright, highly educated and articulate. 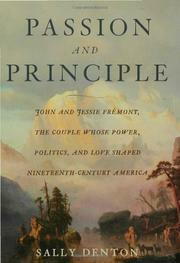 The “passion” of the title alludes to the Frémonts’ very affectionate 50-year marriage and to their commitment to various social and political causes, including abolition. The “principle” lies in their refusal to compromise those core convictions, even when wealth and political power hung in the balance. Denton begins with their initial meeting, described in swooning phrases that would make an apt additional verse to “Some Enchanted Evening.” Indeed, as she retreats in time to summarize her principals’ pre-swoon biographies, the author’s florid prose seems overly colored by the 19th-century sources she consulted (from which she might profitably have ascertained the correct usage of words like “fulsome” and “sojourn”). Denton also repeatedly and unnecessarily quotes from other biographers and historians, sometimes on simple matters of fact. The facts themselves are intriguing. John, the offspring of a dashing French refugee and a Virginia woman who may not have been divorced from her first husband, was 11 years older than Jessie when their son was born in 1813. Jessie was the daughter of aristocratic Senator Thomas Hart Benton, who disapproved so strongly of her suitor that they wed secretly. Together or apart—they were separated for long periods—the Frémonts made a formidable team. They were ambitious, cultivating relationships with some of the most celebrated political and cultural figures of the century. (They once summered with Longfellow and the Whittiers.) He trusted her implicitly and sent her on missions of enormous significance. They made and lost fortunes in gold-mining and railroad speculation—and very nearly won the White House in 1856, when John was the newly formed Republican Party’s first presidential candidate. The Frémonts’ story remains compelling, even when manhandled by a maladroit biographer.